While clocks are something that one would expect to see in every single home, it is not too often that we come across a rather zany clock design. Sure, you can take the boring route with one of those cheap timekeepers from IKEA, or you can go nuts with the $24.99 Oy Vey Clock – where you do not need to worry about the numbers that appear on all 12 equally spaced segments at the sides – simply because there are none to consider in the first place. After all, the Oy Vey Clock shows all of the numbers “fallen” to the bottom due to the effect of gravity, which means you will have to make an educated guess – which should not be too difficult to do. 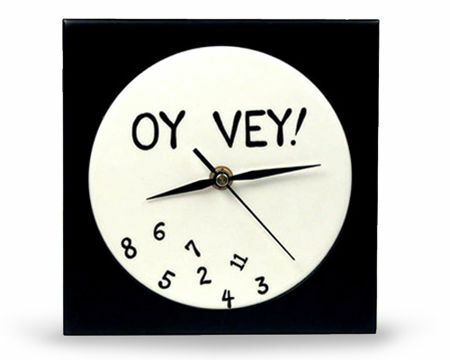 Made out of ceramic and wood, the Oy Vey Clock is powered by a single AA battery.